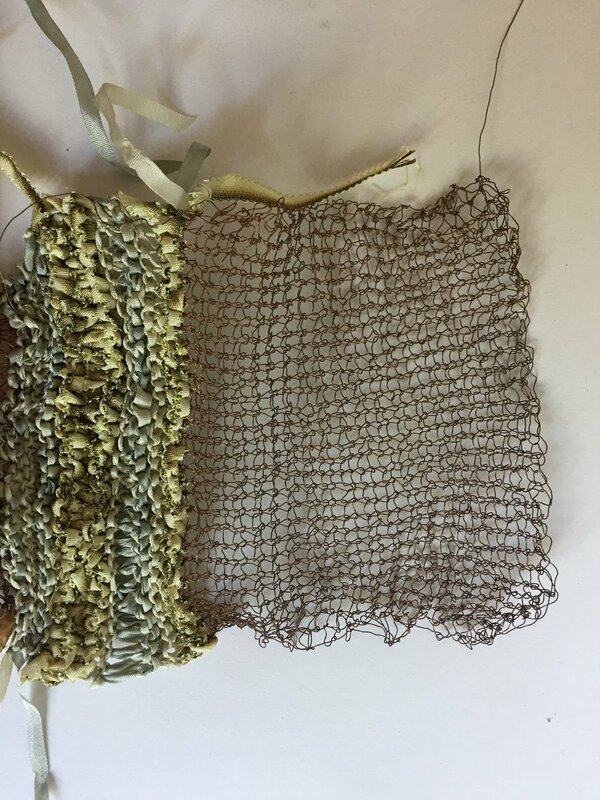 [Editor’s Note]: The following blog post by Program Coordinator Nico Chen describes a daylong professional development facilitated by Brooke Toczylowski and Paula Mitchell. Agency by Design Oakland partners with various schools and districts to offer customizable workshops and coaching. Workshops range in length from short meetings to multi-day intensives. Agency by Design Oakland team members also work with individuals and groups through one-on-one and small group coaching and consultations. 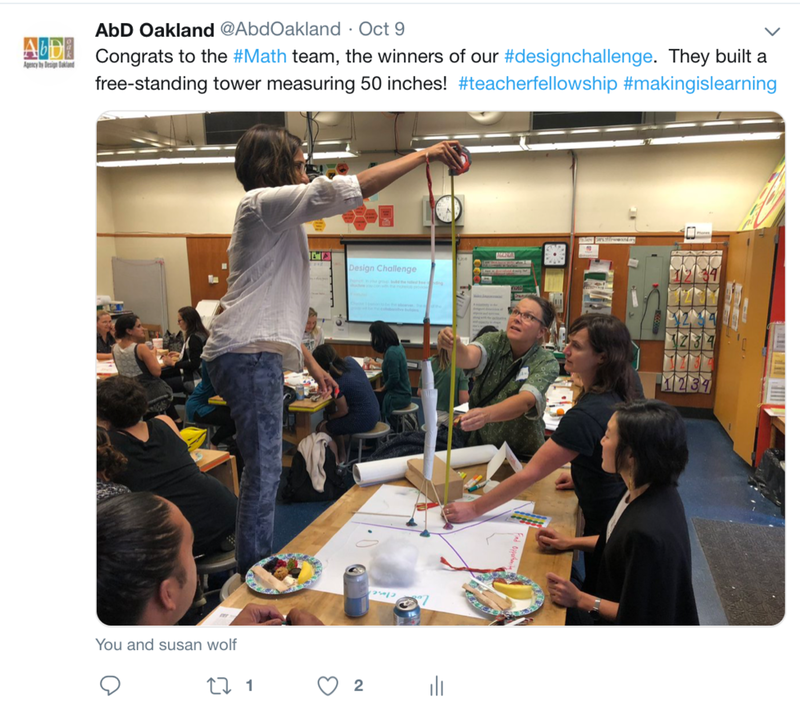 If you or your school site are interested in Agency by Design Oakland workshops or coaching, please email Brooke Toczylowski at brooke.toczylowski@ousd.org. Agency by Design Oakland spent a day with the educators from Civicorps, a continuation high school in West Oakland for students ages 18-26. Our day of professional development focused on Maker Empowerment and Systems Thinking. Below are some “Aha!” moments from our day of hands-on and minds-on maker-centered learning activities. 9:30 a.m. - Design Challenge! The day kicked on with a hands-on activity: a design challenge! We asked our Civicorps educators to split up into teams of 3 and build a chair that holds their own weight using only brads and cardboard. Above are pictures of their resulting creations. While we had most of our Civicorps educators participate in our design challenge, we also asked three Civicorps educators to participate as observers. 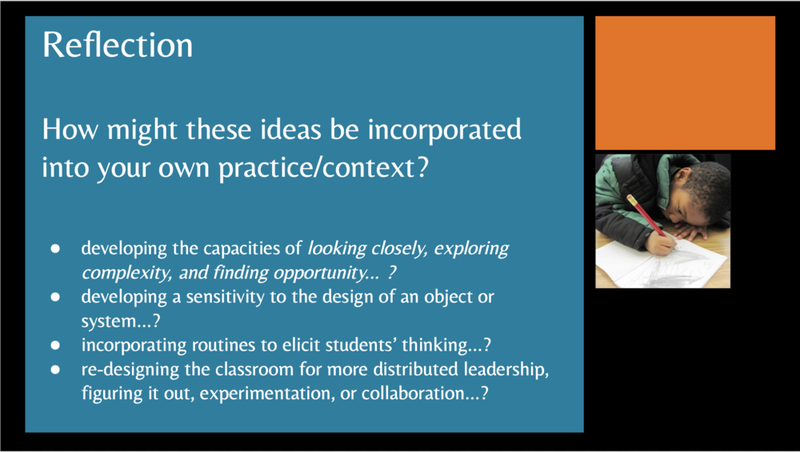 They were given the Agency by Design framework to observe for signs of learning: looking closely, exploring complexity, and finding opportunities to reframe, rethink, and innovate. After our two groups finished their design challenge, our three educator-observers shared out their findings. Health & Wellness Teacher Katrina Lashea noticed how teachers were looking closely through “a lot of communication and generating lots of possibilities.” “I noticed everybody paid attention to each other both physically and idealistically,” said College Counselor Deneah Murphy. “The teachers were exploring complexity because everybody had their own idea about what the chair would look like but they found ways to incorporate everybody’s ideas into making their chairs.” English Teacher Joseph Bradshaw noticed that both groups “seemed very focused” and were finding opportunity when they “testing out the different pieces of cardboard” and “took advantage of the creases in the cardboard pieces that they found.” “Towards the end, there was a lot of celebration,” said Lashea. We asked our Civicorps educators to get into new groups and to choose an object to take apart — one group chose an old office phone, while the other group chose a small speaker. Using the Parts, Purposes, Complexities thinking routine, our groups looked at their taken-apart object closely and documented their thinking on paper. We then asked our Civicorps educators to get into groups and to choose a system to analyze through the Parts, People, Interactions thinking routine. Using the materials available, each group sketched out a visual representation of their system. After completing this minds-on activity, we asked our Civicorps educators to push their thinking with the Imagine If… thinking routine and to document their thinking on paper. Crystal Barajas Barr is the Art and STE(A)M Teacher at Urban Promise Academy Middle in Oakland. 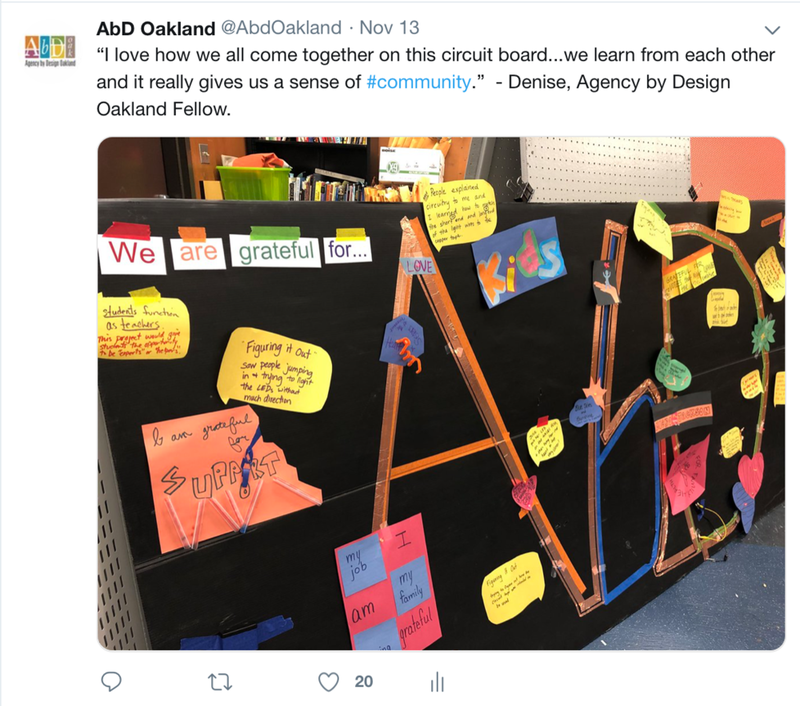 As part of her inquiry as an Agency by Design Oakland teacher fellow, she decided to explore the questions: Who are makers? What is making? How do we define technology? Who gets to define which tech is valuable? 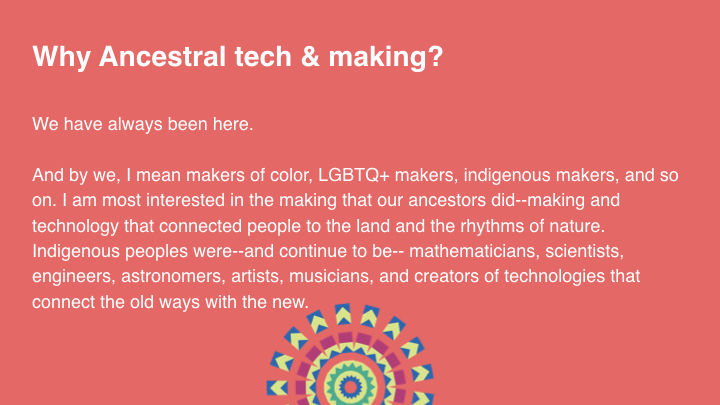 Out of these questions, Ancestral Tech and Making emerged. 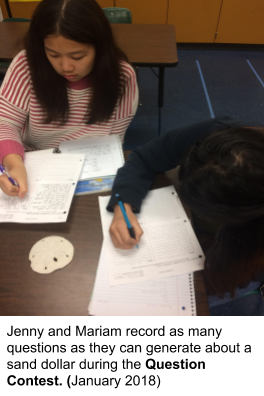 "Being curious, asking questions, facilitating a person's learning process by encouraging them to consider the question at hand from a different perspective is a part of maker-centered learning." Crystal Barajas Barr has been a tinkerer all her life. She studied art with an emphasis in metal fabrication/sculpture, and is experienced in welding and casting bronze and aluminum. 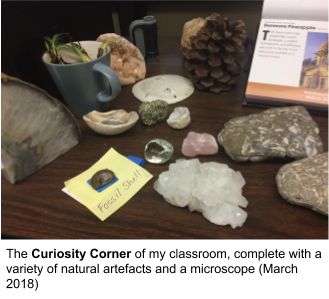 Crystal is UPA's Art Teacher, STEAM teacher (at the Create Lab), and the GSA (Gender and Sexualities) Liaison in a school community that encourages social-justice education, self-reflection, innovation, and imagination. In addition to her role as a teacher and liaison, Crystal is also a maker of things and is always very curious about materials and processes. Currently, she enjoys playing with arduino kits and soundart in addition to writing, music, gardening, and exploring in nature. While we appreciate our time off this holiday season to gather with our family and friends, we are deeply grateful for the time that we have with our community of dedicated educators through our teacher fellowship. 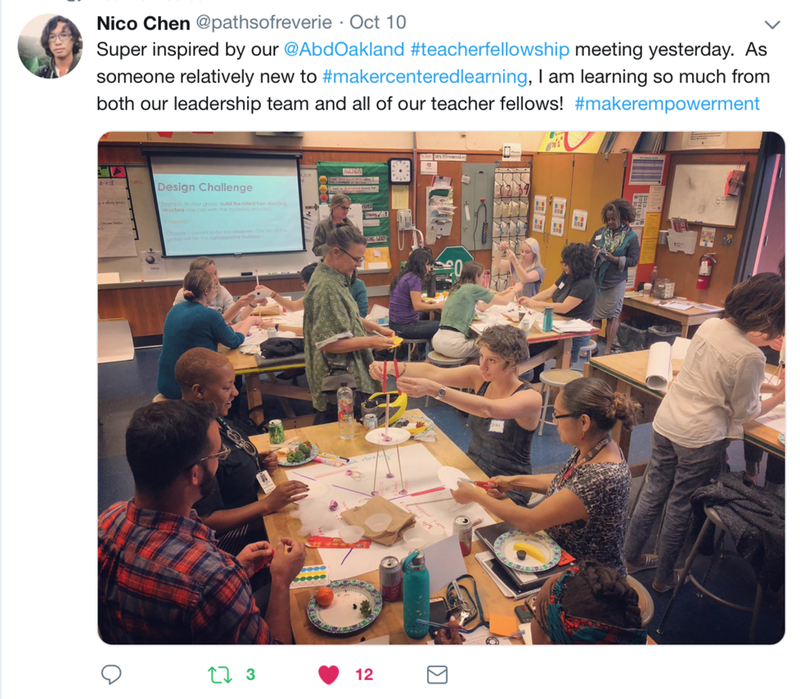 Our monthly gatherings crackle with curiosity, and flourish with our educators' willingness to try on the innovative ideas that will empower our Oakland students through maker-centered learning.